A suspicious package contained a "manipulated" toner cartridge that had white powder on it, a law enforcement source said. For more coverage visit CNN affiliates WPVI and WABC. Are you there? Send pictures and video. (CNN) -- Two packages found abroad that were bound for Jewish organizations in the United States contained a massive amount of explosive material that would have triggered a powerful blast, a source close to the investigation has told CNN. 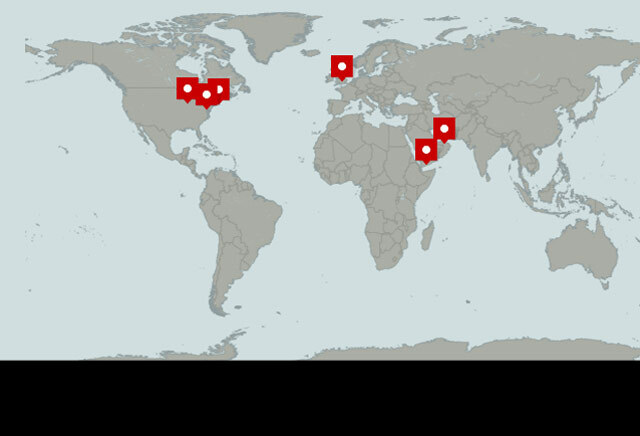 President Barack Obama confirmed that the packages -- intercepted in the United Kingdom and the United Arab Emirates -- originated in Yemen, the stronghold of al Qaeda in the Arabian Peninsula. "We also know that al Qaeda in the Arabian Peninsula ... continues to plan attacks against our homeland, our citizens, and our friends and allies," he said during a press briefing on the incident. The circuit board bears similarities to a cell-phone, according to an engineer for a wireless phone parts manufacturer. In a statement Saturday, Dubai police said explosives in a package set to be shipped on a FedEx cargo plane had been "professionally" loaded in a package and connected via an electric circuit to a mobile phone chip hidden inside a printer. "The plot style carries features similar to previous attacks carried out by terrorist organizations like Al Qaeda," the statement said according to WAM official news agency. 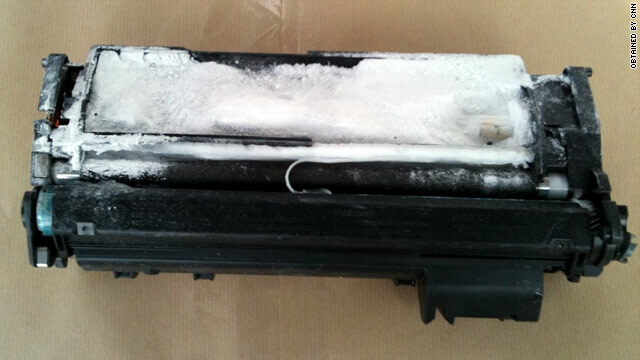 Another suspicious package, found at the UK's East Midlands Airport, contained a "manipulated" toner cartridge and had white powder on it as well as wires and a circuit board, a law enforcement source said. The source close to the investigation said the type of material found in the devices was PETN, a highly explosive organic compound belonging to the same chemical family as nitroglycerin. Just six grams of PETN is enough to blow a hole in the fuselage of an aircraft. PETN was allegedly one of the components of the bomb concealed by Umar Farouk AbdulMutallab, the Nigerian man accused of trying to set off an explosion aboard Northwest Airlines Flight 253 as it approached Detroit, Michigan, on December 25. AbdulMutallab is alleged to have been carrying 80 grams of PETN in that botched attack -- also believed to be the workings of al Qaeda in the Arabian Peninsula. 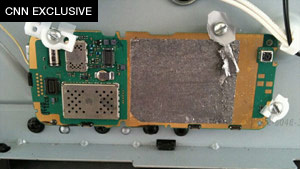 By comparison, the source said the two devices found Friday contained multiple times more PETN. The source also said it appears the devices were designed to be detonated by a cell phone with the help of a smaller amount of a second unidentified explosive substance. The cell-phone theory was seconded by a wireless engineer for a major U.S.-based manufacturer, who analyzed a photo of one of the devices at CNN's request. "This size and the shape of the PCB (printed circuit board) are typical to a handset cell phone type device," wrote Olivier Clerc, hardware application engineering manager for a cell-phone-parts manufacturer. Both packages were bound for the United States, "specifically two places of Jewish worship in Chicago," Obama said. The packages led to increased searches of cargo planes and trucks in several U.S. cities, said law enforcement sources with detailed knowledge of the investigation. White House counterterrorism chief John Brennan said that "the materials that were found and the device that was discovered were intended to do harm." Brennan said the discovery of the packages was made with help from Saudi Arabia, and issued a statement thanking the country for its "assistance in developing information that helped underscore the imminence of the threat emanating from Yemen." A source with firsthand knowledge of the information told CNN that the Saudi Arabian government gave the United States tracking numbers of the two packages, allowing for quick tracing to the United Kingdom and Dubai. Senate Intelligence Committee Chairwoman Dianne Feinstein, D-California, called the potential plot "a new novel thing -- and that is using FedEx and UPS planes to perhaps bring in something that might be explosive." The Transportation Security Administration issued Friday afternoon a halt in the United States on all packages originating from Yemen, and shipping companies UPS, FedEx and DHL all said they were complying with the order. Sen. Susan Collins, the ranking Republican on the Senate Homeland Security Committee, told CNN she is very concerned about holes in the system to screen cargo coming into the United States, said that had a credible intelligence source not warned about the suspicious packages, they may not have been detected with standard security procedures. Collins, who was briefed by TSA chief John Pistole, said intelligence officials do not know yet if this was part of a larger plot, but she does believe al Qaeda is "continuing to test for vulnerabilities in our security system, and it appears we do have vulnerabilities in our system for transporting cargo." After the packages were found Thursday night and Friday morning, authorities were tracking other packages shipped from Yemen in the same time frame, a law enforcement source said. A Yemeni diplomat in Washington said that his government has opened a full-scale investigation into the incident but that it was too early to speculate or reach any conclusions. Counterterrorism officials are taking the threat "very seriously," Obama said. The Department of Homeland Security said it "had taken a number of steps to enhance security," including "heightened cargo screening and additional security at airports." Some Jewish religious leaders in Chicago were alerted to the potential threat Friday, said Linda Haase, spokeswoman for the Jewish Federation of Metropolitan Chicago. "We were notified about this earlier this morning," she said. "We are taking appropriate precautions, and we are advising local synagogues to do the same." Rabbi Marvin Hier of the Simon Wiesenthal Center in Los Angeles, California, said that if synagogues were indeed the intended recipients of the packages, "this is just another indication of the dangerous world we live in where Jews are the principle target." Meanwhile, U.S. authorities seemed most focused on inspecting cargo planes. Investigators examined two UPS planes that landed at Philadelphia International Airport in Pennsylvania and another at Newark Liberty International Airport in New Jersey, said Mike Mangeot, a UPS spokesman. Authorities later gave the "all-clear" at both airports, the Transportation Security Administration said. The TSA said authorities acted "out of an abundance of caution." CNN's Paul Cruickshank, Eden Pontz, Mark Norman, Ross Levitt, Jeanne Meserve, Susan Candiotti, Caroline Paterson, Per Nyberg, Alan Duke, Steve Kastenbaum, Fran Townsend, Mike Ahlers, Carol Cratty, Chris Lawrence, Elise Labott, Pam Benson and Allan Chernoff contributed to this report.